Here is a reminder of some of the ways you and your congregation can celebrate MCC’s 50 years of queer, Christian ministry in preparation for our global gathering at General Conference. 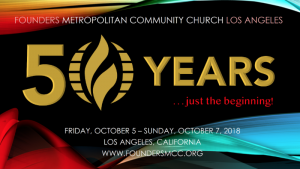 Founders MCC invites all to share in Anniversary celebrations in Los Angeles both in person, virtually or by sponsoring this great event! 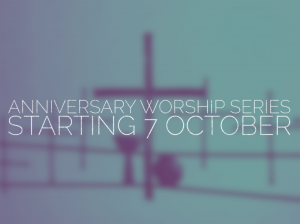 As you plan your local celebration, some resources for a 5-week Anniversary Worship Series are linked below. You can also find them at https://celebrate.mccchurch.org/anniversary-worship-materials/. What is your favorite General Conference memory and why are you looking forward to this next conference? Send your unedited video to: [email protected] and we will share your story! Yes, General Conference is happening as planned! 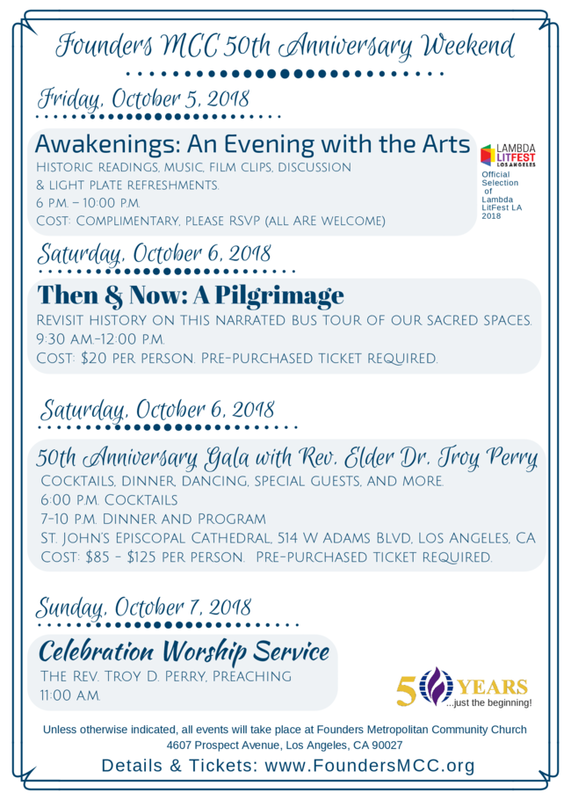 Continue celebrating our 50th Anniversary by registering for General Conference! The Business Forum and Business Meeting will convene to discuss business, vote for a Moderator, Governing Board members, and other items of business presented to the delegates. A variety of Pre-Conference Institutes are available to equip and connect all types of leaders, learn new skills, and even take an intentional retreat. MCC’s 50th Anniversary Gayla is Sunday night before Conference officially begins. 50th Anniversary Archival displays across the decades, curated by a group of MCCers, will showcase materials significant to MCC’s impact on the world! Look for more information on all of these things in the coming weeks! Every General Conference is self-funded, meaning registration, offerings, and other official activities ensure General Conference is a success. Lay Delegates, Clergy, and all persons within MCC are invited to register today. The number of hotel rooms available is limited, reserve your room to ensure your spot in the General Conference hotel. Download the APP for Metropolitan Community Churches for iPhone and Android and bookmark Celebrate.MCCchurch.net to keep up with the latest MCC General Conference announcements! Coming to LA? Rev. Troy Perry has requested that folks in attendance wear gold and white. Even if you are not coming to Founders for the 50th wear your gold and white on Anniversary Sunday in celebration! Founders MCC’s 50th Anniversary committee is encouraging MCC’s from around the world to record a 30 second video congratulating Rev. 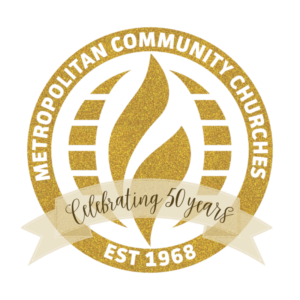 Elder Troy Perry on the 50th Anniversary of Metropolitan Community Church. r message in the highest resolution of your camera. Make sure your email has the churches full name, location and Pastor’s or Lay Leader’s name. Can’t make it to LA? 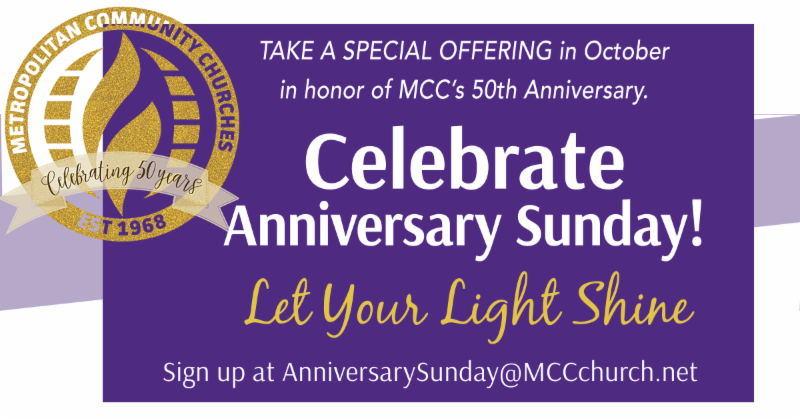 Celebrate MCC’s 50th Anniversary in your own congregation!